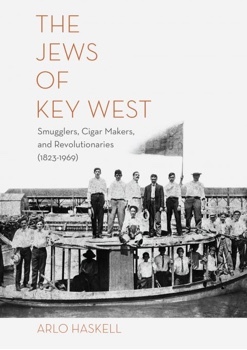 Arlo Haskell is the author of The Jews of Key West: Smugglers, Cigar Makers, and Revolutionaries (1823-1969) (Sand Paper Press, November 2017) and executive director of the Key West Literary Seminar. He is also the author of the poetry collection, Joker, and the editor of poetry volumes by Harry Mathews and Héctor Viel Temperley. Scenes of Jewish suffering like these helped focus Martí’s attention on the persecution he and other Cuban dissidents had experienced under Spanish rule, and on the exile they faced in the wake of the Ten Years War, the brutal, failed campaign for independence that had ended with Cuban surrender to the Spanish in 1876. Writings on Jewish themes eventually helped Martí galvanize an unexpected group of supporters to his nationalist cause. The most significant of his surprise alliances unfolded during the 1890s in the Jewish community of Key West, Florida, where dozens of Jews joined the Cuban Revolutionary Party and funneled weapons to the rebel forces that would finally end Spanish rule over Cuba. The island city of Key West was an ideal laboratory for Martí’s experiment in pan-national nationalism. A nominally American city in a former Confederate state, Key West exhibited strikingly progressive politics. During and after the Ten Years War, thousands of Cuban exiles had settled on this five-square-mile mass of limestone, where many found work in a cigar-making industry that had been transformed by powerful Jewish manufacturers including Samuel Seidenberg and Pincus Pohalski. Voters here elected the son of a Cuban revolutionary hero as their mayor and delivered two Cuban natives to the state legislature in Tallahassee. Black men held the offices of county sheriff and county judge. Dozens of immigrant Jewish peddlers from Romania, Lithuania, Poland, and elsewhere throughout Eastern Europe settled here after the great fire of 1886. They established political and social organizations like the Jewish Alliance and participated in the thriving economy that made Key West, for a time, the wealthiest city, per-capita, in the nation. When Martí arrived in Key West on New Year’s Day of 1892, he was already well known as a charismatic speaker and was gaining respect as a savvy political organizer. As he solidified his leadership over the Cuban Revolutionary Party and raised funds for the revolution, he also broadened his political base, adding Jewish immigrants and Anglo-American sympathizers to the white and black Cuban factory workers who had long been his most ardent followers. One of Martí’s most important Jewish supporters was Edward Steinberg, a successful proprietor of a local dry goods store, who hosted the lavish reception that followed Martí’s historic New Year’s Day rally and arranged for Martí to give a private address to the Jewish Alliance. Another crucial ally in Martí’s cultivation of Jewish support was General Carlos Roloff Mialofsky, a Polish-Jewish veteran of the Cuban revolutionary forces who had survived the Ten Years War. The multilingual Mialofsky (he is said to have been fluent in seven languages) met frequently with local Jewish leaders, developing working relationships between party chiefs and the Yiddish-, Russian-, Lithuanian-, and Polish-speaking Jews of Key West. A major speech Mialofsky gave in Key West clarified the argument for Jewish support of the Cuban cause. “Compatriots, I am the son of unfortunate Poland…. Destiny has been adverse to us … but because I cannot offer my life for the country of my birth, I put all of my efforts for the freedom of that other land where I have lived among heroic men.” It went without saying that Spain, which had persecuted Jews for centuries under the Inquisition, was the common enemy of Cubans and Jews alike. One Cuban general who was familiar with the Jewish community’s wartime efforts remarked: “When it came time to serve Cuba, they were themselves Cubans. They placed Cuba before their own homeland, and therefore they did so much more than Cubans.” Jews in Key West maintained their support even as Martí was killed in battle, and during the early years of independence many resettled in Cuba, where they hoped to see the realization of his egalitarian vision. Unfortunately, as the Cuban state matured, Martían idealism gave way to a harder and more typical nationalism. Racial relations among whites and blacks remained relatively progressive in early-twentieth-century Cuba, but Jews often found themselves, again, as outcasts. For a fleeting but critical moment, José Martí and the Jews of Key West had shown the dramatic potential of a populist movement founded upon an ideology of equality and human rights. “With all, and for the good of all” had been Martí's rallying cry, and in the Jews of Key West he had found committed idealists who would put his words into action.